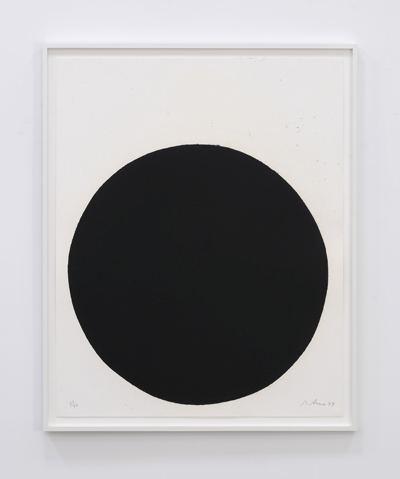 A selection of post-1989 prints by Richard Serra (b.1939, San Francisco) will be on view at Galerie m Bochum from June 20 to July 18, 2015. The gallery has been working with the internationally acclaimed artist since the 1970s. The prints represent an autonomous complex within his artistic oeuvre, one in which he has developed his own singular forms of expression. Distinguishing these works on paper is an extraordinary physical presence and materiality. Mass, volume, proportion, and form of the image content generate an imposing sense of immediacy. The juxtaposition of the exhibited images highlights the artist’s differentiated use of printing techniques to create a variety of effects, and ultimately Serra’s experimental handling of the medium as he pushes the limits of the technology.